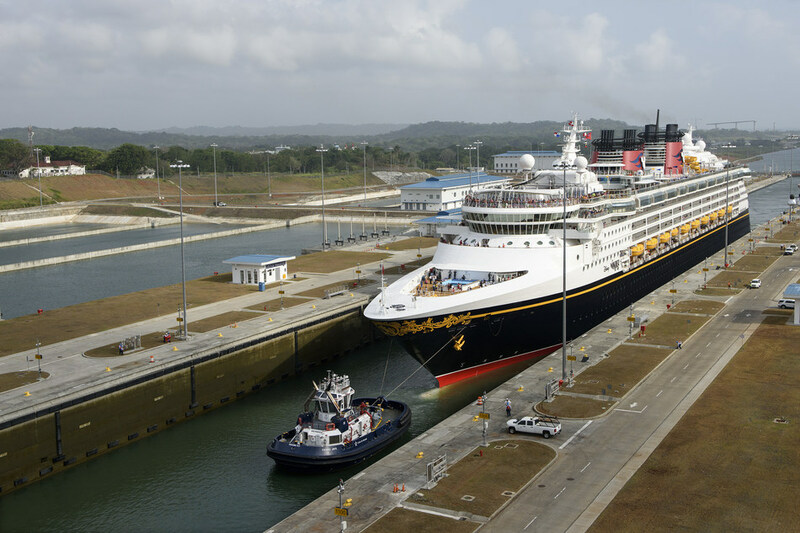 The Disney Wonder transited the Panama Canal as the first passenger vessel to go through the canal’s new set of locks, marking a milestone for the cruise industry. The Disney Cruise Line 2,713-passenger ship was transformed in late 2016, expanding the length of the Disney Wonder to 984 feet. Headlining the ship’s enhancements are new imaginative spaces for children – including areas themed to the Marvel Universe and Disney’s “Frozen” – a jazzy restaurant inspired by Disney’s “Princess and the Frog,” and an authentic neighborhood English pub with subtle nods to classic Disney films. The Disney Wonder Panama Canal crossing is part of a 14-night voyage from Port Canaveral, Fla., to San Diego, where the ship will sail cruises to Baja, Mexico, before a summer season from Vancouver to Alaska. According to sources with direct knowledge of Disney’s plans, the company is in late-stage negotiation with at least two manufacturers of autonomous shuttles – Local Motors, based in Phoenix, and Navya, based in Paris. It’s unclear whether contracts would go to both or just one of the companies. A barrage of media coverage on driverless cars over the last year or so has primed the public for their appearance on public roads. Although vehicle manufacturers say individuals won’t be able to buy driverless cars for several years, vehicles are being gradually introduced to the public in limited areas. Autonomous shuttles are bound to be “the first exposure most people have to driverless technology,” said Ben Stinnet, chief operating officer at Auro Robotics, a start-up in Santa Clara, Calif. The company, which is not involved in the Disney deal, is testing small shuttles at Santa Clara University. Most of the vehicles are shaped like tall bricks on wheels. With plenty of headroom, the shuttles typically can carry up to 12 to 15 passengers. Equipped with cameras, radar and laser sensors, they’re limited in “geofenced” areas – zones where the environment is well-mapped and understood by the vehicles’ artificial intelligence software and hardware. Driverless vehicles “would make transportation at Disney World cool again,” columnist John Frost wrote on the Disney Blog in 2013. No one’s sure how big the market for autonomous shuttles might be. Driverless technology and app-based on-demand transportation are expected to transform public transportation. But huge questions remain unanswered. Will cities go driverless with their big buses? Or will those be gradually replaced by smaller shuttles driving dynamic custom routes, based on demand? In January, the company demonstrated the Olli on the Las Vegas Strip during the Consumer Electronics Show, and it plans a more permanent deployment. D23 recently shared that Disney Legend Alan Menken would perform a one-man concert (twice!) in Hall D23 at D23 Expo. Now, we’re excited to share the full schedule of amazing panels and presentations coming to our biggest D23 Expo stage, Hall D23. Take a look at the lineup below, and learn more about the ultimate Disney fan event here. Disney Legends Awards Ceremony (10 a.m.)––Disney Chairman and CEO Bob Iger will kick off this year’s D23 Expo with the special ceremony that honors this year’s Disney Legends Award recipients. See the full list of 2017 honorees here. Walt Disney Animation Studios and Pixar Animation Studios (2:30 p.m.)––See what the artists behind these two acclaimed animation studios are dreaming (and drawing) up. With such an exciting lineup of films––Ralph Breaks the Internet: Wreck-it Ralph 2, Coco, and The Incredibles 2, just to name a few––we’re sure this presentation will be full of surprises. The Walt Disney Studios Live-Action Films (10:30 a.m.)––The wonderful worlds of Disney, Marvel and Lucasfilm come together to showcase their exciting slate of upcoming films. At D23 Expo 2015, we got our first glimpses at Star Wars: The Force Awakens, Beauty and the Beast, Doctor Strange, and more fan favorites… We can’t wait to see what’s on deck for this year’s presentation! Walt Disney Parks and Resorts (3 p.m.)––Disney Parks and Resorts Chairman Bob Chapek will take the stage during this presentation to share what’s new and what’s next at Disney Parks and Resorts around the globe. A Whole New World of Alan Menken (1:30 p.m. and 5 p.m.)––Celebrate the magic of Disney music with Disney Legend and eight-time Oscar®-winner Alan Menken in his brand-new one-man show. Alan will perform his own music and tell tales from his storied career. Along with the release of today’s Free Dining package, Disney has also released three more offers, including a room-only offer. Plus, you can uncover a magical mix of new and unforgettable experiences when they add theme park admission, including Pandora – The World of Avatar at Disney’s Animal Kingdom® Theme Park. You can enjoy a package that includes a 4-night stay in a standard room at a select Disney’s All-Star Resort and 4-day Magic Your Way base tickets for as low as $1,890. * Sample package price is valid for a family of 4 for stays most Sunday through Thursday nights from August 13 through October 5, 2017. Late summer is a great time for you to sneak in a family vacation at Walt Disney World® Resort. Together, you can explore exciting experiences across all 4 theme parks—and still be among the first to visit Pandora – The World of Avatar, an all-new awe-inspiring land at Disney’s Animal Kingdom® theme park. Book through August 31, 2017. *Price based on 2 adults, 1 junior (ages 10-17) and 1 child (ages 3-9). The number of packages available at this rate is limited. Savings based on the non-discounted price of the same package. Tickets are valid for one Theme Park per day and must be used within 14 days of first use. Cannot be combined with any other discount or promotion. Advance reservations required. You can explore a package that includes a 3-night stay in a standard room at a select Disney’s All-Star Resort and 2-day Magic Your Way base tickets for as low as $938*. Sample package price is valid for a family of 3 for stays most Sunday through Thursday nights from August 13 through October 5, 2017, when you book from now through August 31, 2017. With this offer, you can uncover a treasure trove of fun together, including up-close encounters with Disney Junior pals, sing-along stage shows and more than 80 preschool-friendly attractions. *Price based on 2 adults and 1 child (ages 3-9). The number of packages available at this rate is limited. Savings based on the non-discounted price of the same package. Tickets are valid for one Theme Park per day and must be used within 14 days of first use. Cannot be combined with any other discount or promotion. Advance reservations required. Get ready to initiate power transfer in 3…2…1… when the classic Space Mountain returns to Disneyland June 1! Just days after we mark the 40th anniversary of this Tomorrowland favorite, space travelers will blast off once again for their intergalactic adventure. A variation of a concept Walt Disney developed in the 1960s, Space Mountain first opened at the Magic Kingdom at Walt Disney World Resort in 1975, and construction on Space Mountain at Disneyland began soon after. The attraction went on to become a guest favorite, seeing special themed versions such as Space Mountain Ghost Galaxy and Hyperspace Mountain. You are clear for launch starting June 1 with the return of Space Mountain at Disneyland.